Florida Real Estate: Riverbend Home In Palm City On The Market! This stunning builder's model home is now on the market in the exclusive neighborhood of Riverbend in Palm City. This is a one of a kind chance to own a home with two hundred feet of water frontage on the Saint Lucie river. This home features a private dock perfect for the avid boater to be able to get on and get to the ocean with no fixed bridges. This five bedroom and six full bathroom home is generously laid out over five thousand and eight hundred square feet of perfectly appointed living space. When you walk into the foyer of this gem you the opulent double staircases is a main focal point. The chef's dream kitchen features custom wooden and glass cabinetry, sleek marble modern counter tops, a full suite of designer stainless steel appliances and six burner natural gas range. 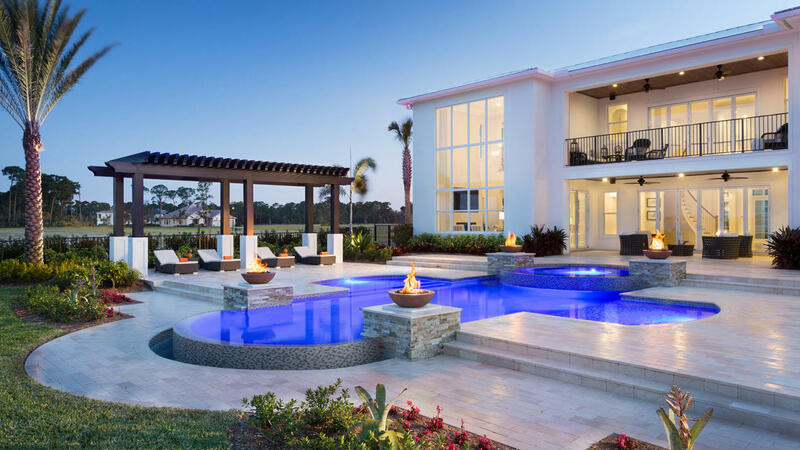 The backyard oasis has a resort inspired infinity edge and spa to relax and enjoy Florida's sunshine. The second floor loggia is a perfect way to sit back and enjoy glimmering sunsets while entertaining your guests.This home comes with a builder warranty. 3042 Radcliffe Way located in Palm City and is currently asking $2,799,990.00.